Professor Aaron H. Caplan's An Integrated Approach to Constitutional Law is a "groundbreaking casebook is ideal for one-semester introductory Constitutional Law courses of 3–5 units that teach both structure and rights. Its novel approach presents constitutional law as a coherent system, not as isolated doctrines in silos. 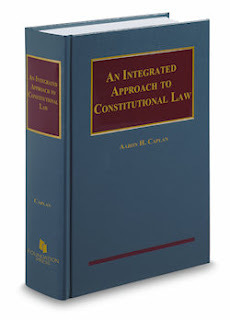 The book integrates subjects ordinarily taught in Con Law I and II; it integrates historical and doctrinal approaches; it integrates features of a casebook and a study guide; and it presents each case as an integrated whole, so that students learn relationships among doctrines while studying the details of each. Its tone is accessible, while its structure allows for sophisticated classroom discussion. A detailed teacher's manual offers charts, graphics, and additional source materials, significantly enhancing accessibility for first-time adopters."